My love of brownies is really infinite! I make them in every way I possible can! I’ve tried making chocolate chip cookie dough brownies before, but they were a big fat mess. They tasted good, but were so ugly! This week, my husband needed a treat to take to his school. So, I used this opportunity to try a challenge. 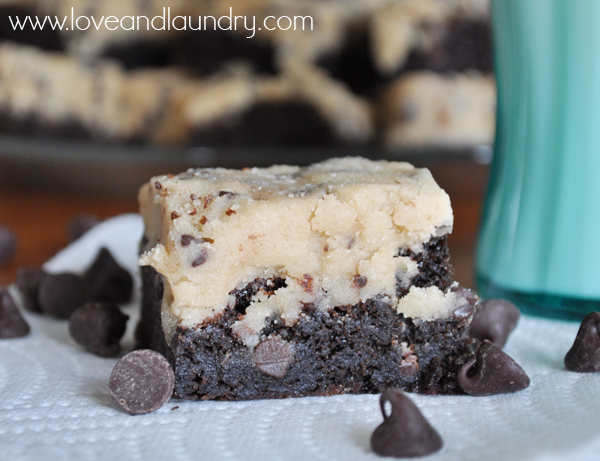 Make cookie dough brownies that not only tasted amazing, but looked pretty as well! Preheat the oven to 350. Line a 9×13-inch pan with tin foil and coat the tin foil very well with cooking spray. Mix the butter and brown sugar for 3-5 minutes (until it is really light in color and very fluffy). Add the eggs and vanilla. Add the chocolate and mix until well combined. Add the baking soda, baking powder and flour until just combined (don’t over mix!!). Bake at 350 for 25 – 30 minutes, or until a toothpick comes out clean. After they are done baking, the brownies need to cool and then be refrigerated until they are COLD. That’s part of the trick of getting the cookie dough to spread right. 1 12 oz bag of mini chocolate chips (If you’re in a pinch, I think regular sized chocolate chips would work, too). While the brownies are baking, make the cookie dough. Mix the butter and both sugars for 3-5 minutes until it’s really light in color and fluffy. Add the cream and vanilla and mix in really well. Add the flour and mix until just combined. Mix in the chocolate chips. Now, put it in the fridge and let it firm up (if you can resist eating the whole bowl! Trust me, it’s hard!). To assemble, spread the cookie dough on top of the brownie. I used a spatula to get it as smooth as I could on the top. After the cookie dough is spread, take the brownies out of the pan using the tin foil. I like mine to be really pretty (after having such a hard time before! ), so I trimmed all of the edges off the brownie before cutting them into squares. Depending on how big you want them, cut them into squares. I got 24 squares out of the pan. Oh my goodness, these will change your life, they are so good! Yum! I am pinning this! Shatzi, these were amazing! They looked so nice and tasted delicious! Two of my favorite desserts combined! I really don’t think you can have too many brownie recipes. Or cookie recipes. 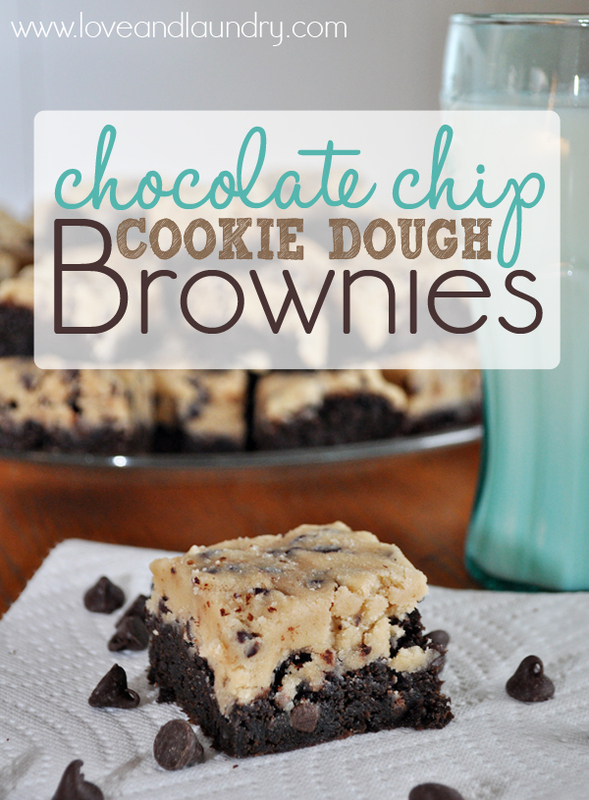 Or cookie dough brownie recipes. These look great. I can’t wait to try them. I’m glad I added you to my bloglovin’ feed!